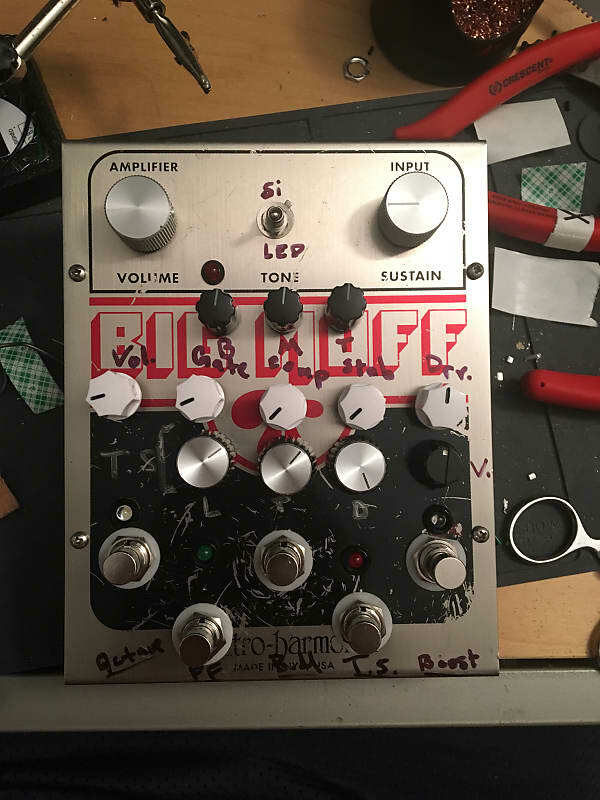 This is a multi-effects clone pedal I made using the enclosure and guts of an NYC big muff. boost—>ts-808—>Big Muff (with diode switcher and 3-band eq)—>fuzz factory—>Green ringer. All circuits were done on strip board using tagboardeffects.blogspot.com layouts, except for the big muff, which is ehx’s board, and the 3 band eq, which is a pcb from guitarpcb.com. The boost is tim escobedo’s jet boost, or as most people would recognize as JHS’s mini bomb boost. I love escobedo’s original circuit. The trimmer is there to bias the jfet, but you can play around with the trimmer and get more or less aggressive boost sounds overall. It goes from a really nice low sparkle to a harder hitting gritty sound that is awesome pushed into other overdrives. I have a standalone pedal on my main board that I almost never turn off. The TS-808 is pretty much just that. Standard tube screamer sounds with no frills about it. I love the big muff so much more with the 3 band. It really opens the sound up for me and I like it so much more with the mids. The circuit becomes really loud without that original tone stage. Dont know if thats for real because there isn’t a transistor stage loading the signal down, or if I just imagine it being so. But the circuit overall is at unity at ~8/9 o’clock. The Diode switcher is pretty useless in this build, mostly because of the removal of the tone stage (I think). Ive had other big muffs with this mod and the difference was night and day between Silicon and LEDS, like I have in there right now. Fuzz factory is insane. And that is really the only thing to say about it. Great fuzz tones, and great squeals. It can do whatever floats your boat. PLEASE NOTE: This circuit is unstable. It will give you squeals and oscillations on certain settings. In some cases, if you leave it on a crazy setting, it can influence the bypass setting because of how this pedal is wired on the inside. I tried to keep interference to a minimum, but it can happen... As long as you arent starving the voltage, everything works great. Finally, the green ringer— gives a nice slight volume boost, and has a great doubling effect that gives you an octave up effect, especially higher up on the neck. Stack od’s before to create a more pronounced effect. If youre interested in this pedal, *please* make sure you have an acceptable power supply to run it with (isolated). I tried to minimize all potential power problems, but because of the way the insides are laid out and the circuits involved, interference could happen if you are running dirty power. I run it on a truetone Cs7 and it operates excellently though. Feel free to message me any questions. I cover all of my pedals with a warranty. If a problem ever arises that is a result of my work, or even just normal wear and tear that take place, then I will fix it for you!!! Items may not be returned unless arriving different than as described.